Ours is just an ordinary family home but there are a few signs of our minimalist tendencies. 1. We have a dishwasher but we use it only once a day after our evening meal. With both of us at home quite a lot of the time we wash-up by hand as we go along throughout the day. The boys take it in turns to load and empty the dishwasher each evening which they have been doing for a few years. We use a smaller than average washing up bowl that we bought in France and used to have for our campervan. This saves on water and I think it's cute too. 2. I do a lot of my shopping in budget supermarkets and I don't like the packaging of a lot of the goods I buy (I don't really agree with excess packaging at all, but it's not easy to live without it). My solution is to decant ordinary household products into neutral containers. I like this simple look and I prefer not to be bombarded with advertising every time I carry out a domestic task. I found this cereal container in a charity shop and use it for washing powder. Also, having got rid of our tumble dryer we are saving more money on our laundry routine than we used to. 3. This kettle was bought when we moved in nine months ago. We chose it for its white colour, design and because it has a smaller than average capacity and is therefore eco friendly. 4. 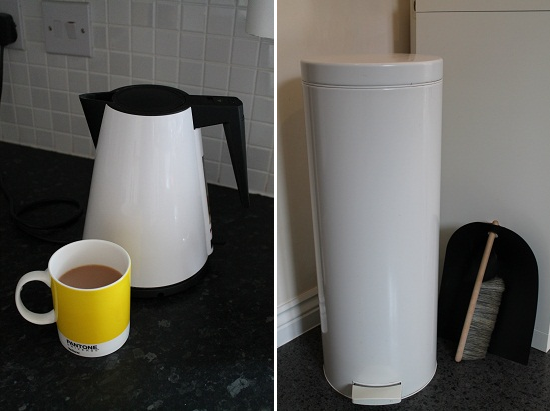 I had to compromise on the size of our kitchen bin as I would have preferred a smaller one. I like the colour and design of this one. I buy white bin liners by the same make as they fit inside and are not visible. The dustpan and brush is designed by Norman Copenhagen and was a present. It has been used constantly but still looks good. I like good design but only if it is reasonably priced. 5. Inspired by this post by Benita at Chez Larsson, I don't buy fancy liquid soap anymore. Instead I decant value bubble bath (works well as soap) into Muji containers. I do the same for shampoo and conditioner - I just make sure they're a different colour. 6. I have picked up several mason jars from charity shops and use them as containers for various food products. I couldn't resist putting marshmallows in this one as they look so pretty, although they don't last long. Doh! I believe simple can be stylish. Living with less can mean lower energy bills, less organising and less pressure from advertising. How about you? Have you simplified anything in your home recently? I put the dog biscuits in a jar like yours today before reading this post - it looks so much better. I also despair of the packaging I find vegetables are the worse so I try to use farmers markets when I can. I will copy your idea with the bubble bath! claire which cheap shampoo do you decant,I am just wondering which one gets your vote as you have lovely hair. Love how you've decanted into your own containers. I hadn't thought of doing that but will be copying your ideas. Have a great weekend. I think I've spent half my life collecting things and am now spending the rest of my life de-cluttering! I have lots of Kilner jars for storage aswell. Love from Mum, visiting on a blog hop. Also for those using liquid detergent for their washing machine - mine got all smelly and I discovered that using powder is not only less packaged water (value for money) but has a cleaning, abrasive action on the pipes. I don't use very much, but since I switched back to powder all is sweet again. I decant the powder, too, as the bags always tear anyway. I decant pretty much everything into the same translucent containers I've had for 15-20 yrs - sugar, flour, different kinds of rice, lentils, polenta, semolina etc. etc. and the pet food (dry), too. Otherwise I'm a bit like Mum ;) - collect collect collect peak declutter declutter declutter!!! I switched to washing powder for the same reason and as I use a small amount it lasts for a long time. I don't use fabric softener anymore either. Thanks for commenting.